A forty-eight-hour state of emergency has been declared in Samoa as the worst of tropical Cyclone Gita passes. Although there have been no reports of casualties, the damage is extensive. Flood waters rushed through the homes and streets of Samoa and gusts nearing 100 kilometres floored roofs, trees, and power lines. 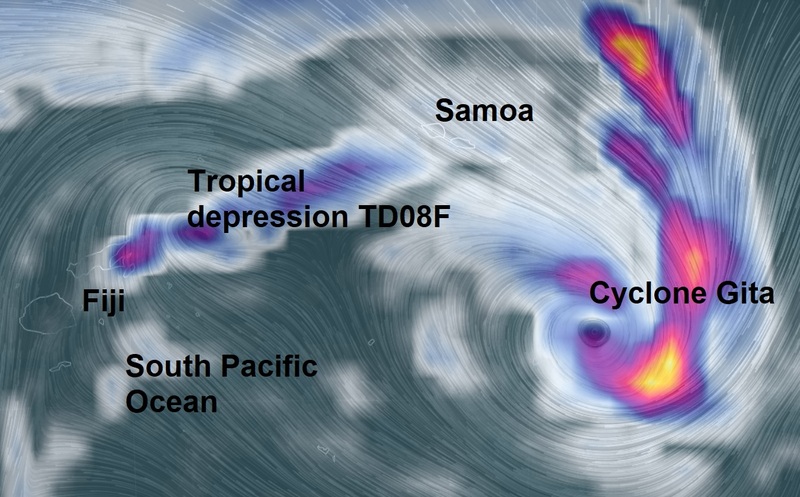 The category two cyclone is expected to pass Niue and will make its way south of Tonga on Monday. Cyclone Gita was high on the agenda during Deputy PM Winston Peters and Australian Minister of Foreign Affairs talks in Auckland today. Minister of Foreign Affairs Julie Bishop says, "Both our nations have offered support and assistance and at this stage, we are monitoring the weather as it unfolds but we both stand ready to provide support should that be required." According to Weather Watch New Zealand, the cyclone could come to New Zealand and may become a bigger storm than the recent ex-cyclone Fehi. However, MetService says a forecast can't be made until tomorrow. Meanwhile, torrential rain continued to pound the greater areas of Suva and Nausori since early this morning. The usual scene of flooded roadside drains and waterways in the town and the city during periods of heavy rain was no different today. Members of the public are advised to keep those raincoats, preferably, and umbrellas handy as the weatherman forecasts these periods of heavy rain to continue until later tomorrow. The special weather bulletin number 79 on heavy rain issued from the Regional Specialised Meteorological Centre (RSMC) in Nadi today that the heavy rain warning in force for Viti Levu, Vanua Levu, Taveuni and nearby smaller islands, Lau and Lomaiviti groups, Kadavu and nearby smaller islands, was also now in force for the rest of Fiji. The weatherman reports that tropical depression TD08F was analyzed about 67km East-southeast of Labasa or about 20km South-southwest of Taveuni at 2 pm today. The RSMC forecasts TD08F to gradually move Northeast between Vanua Levu and Taveuni with associated rain bands affecting the country until later Sunday. The forecast for Fiji, there will be periods of rain, heavy at times and few squally thunderstorms. Members of the public are also advised that localized heavy falls may lead to flooding of low lying areas. The next special weather bulletin on heavy rain will be issued at around 5.30pm later today.